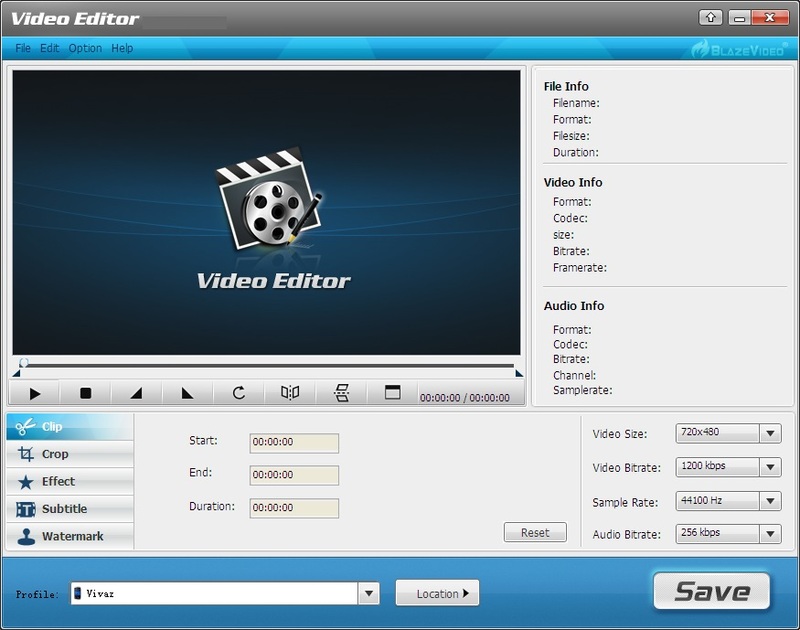 BlazeVideo Video Editor is an easy-to-use video editing program which enables users to edit and personalize videos in almost common formats in a high fast speed. BlazeVideo Video Editor supports almost all types of video formats like RM, RMVB, AVI, WMV, ASF, MPEG, MPG, M1V, MPV2, MP4, DAT, FLV, MOV, VOB,etc. Its intuitive design makes perfect video editing so easy for both media experts and amateurs! Do everything you need to create and edit perfect videos or movies: clip, trim, crop, rotate and flip videos, apply effects in brightness, hue, saturation and contrast, insert text watermark and subtitles. There are also many other predefined video editing effects available for you to choose your best options. People can even preview the video effects in real time with BlazeVideo Video Editor! In addition, users can also convert any video into various video formats which are supported by portable devices such as iPhone/iPad/iPod/Nokia/BlackBerry/HTC and and other mobile phones. Support RM, RMVB, AVI, WMV, ASF, MPEG, MPG, M1V, MPV2, MP4, DAT, FLV, MOV, VOB, etc. Share festival videos or movies with friends or family by iPad, iPod, iPhone, PSP, HTC, Nokia, BlackBerry, known smart phones, etc. BlazeVideo Video Editor is normally priced at $29.95 per license code, and the trial version is limited to output file with 3 minutes only. To celebrate the coming Christmas & New Year, BlazeVideo is launching special giveaway activity and discount offer where you can get Blazevideo Video Editor For Free. Giveaway valid from December 24, 2013 to January 4, 2014. You guys just need to visit the Promo Page, and click on the “Free Download” button to download the giveaway package which contains the installer & license key and you have to active the giveaway edition before the giveaway expires. You guys can save more (nearby 30%) on other products of BlazeVideo by using Coupon Code BLAZEXMAX. So go and grab the products before the offer expires.